When I bought this frame, I loved it. Overall I’m very happy. The style and design are great. The only flaw I see is that the corners can be tough on the shins. Since the bed is somewhat low, I often walk into the corners, which can smart a little. Otherwise this is a great piece and I highly recommend it. Update your bedroom ( and make it more comfortable) with this sleek bed. 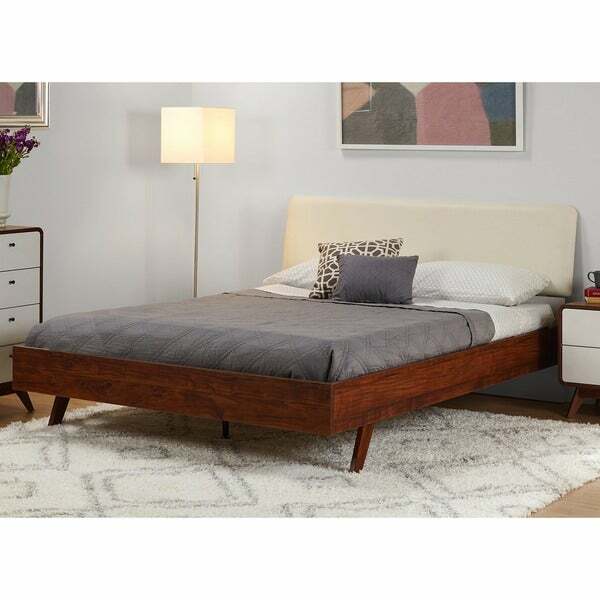 Designed for contemporary interiors, the Cassie Mid-Century Queen Bed by Simple Living features a white upholstered headboard, made of sumptuously smooth, easy-care faux leather. The white upholstery creates a striking contrast against the Walnut-finished frame, crafted of laminated particle board. Angled, solid legs give the bed a mid-century style silhouette. Sit down and grab a blanket/beer because I'm about to tell you the tale of my first furniture purchase, and most prized possession. I bought this bed in May, 2017. It was assembled on June 5th, 2017. While I am what many would consider a "young professional" female, I am infinitely lazy. My laziness knows no bounds, and by the time I needed to actually build this bed, I had already tried my hand at building an Overstock nightstand(it's own nightmare story, just buy one from Target). So, when my roommate's father offered to help build my bed, I hesitantly handed him the instructions as I do not take instruction, even that being read off of a piece of paper that I can see, very well. However, I quickly realized that instead of helping, he would do it all himself and that was just find by me. The build issues small but serious. The headboard attachments were very difficult. The screws had blunt ends and the holes were not threaded(I am guessing. As I said, I did very little work here.) As we continued to build it, every now and then a screw wouldn't go all the way or such and such, but no issues other than the headboard that seemed structurally significant. We ended up getting the bed together by using just a couple of screws for the headboard when Overstock supplied about 12? 18? Who knows man. The whole thing looked great! That is, until today, less than 2 months later. I have been aware of the headboard weakness and have made great strides to not rattle it or stress that side of the bed. Little did I know, luck was waiting for me. On this fine morning, between the hours of 6 AM and 10 AM. A friend and I were "sleeping" on the bed. Think back to the last time you were "sleeping" in the morning. Was it wild? Crazy? Enough to crack a bed in two? No, probably not. Most people don't "sleep" like that. Well as my friend and I (a combined weight under 300 lbs) were SLEEPING, the bed broke and it WASN'T the headboard. It was the particle board that stabilizes the bottom legs against motion from side to side (as well all create when SLEEPING). The board was so cheap, it straight up snapped off the screws and so did the screws that held one leg in place. Listen. We aren't Olympic athletes here. The bed isn't great. It's pretty but get something else. Or bring your own screws. I am very pleased with the Cassie Queen Bed. I really like the mid-century design as it is my favorite style of furniture. It's retro-perfect. The height of the bed is perfect for easy in and out. I truly like the fact that I don't have to deal with a box spring anymore. This is my first foray into a platform bed. The additional slats of the platform and center foot supports add to the strength and sturdiness of the bed. Easy to follow instructions and assembly. i bought the Cassie 4 Drawer Dresser to compliment the bed! I hesitated quite a lot to buy something like this online, but I am glad that I did. The product arrived in three days and wrapped securely. The instruction is very clear and we (two people) assembled it in an hour. It turns out to be a great modern piece in the room. Nice simple design. The walnut finish looks high quality and the light colored leather board feels nice and clean. The metal connectors securely hold boards together, very sturdy and no wobble at all. The metal support legs stay in place and give a good support for the mattress. The product is beyond my expectations and really worth the money. Would highly recommend to everyone. I owned this bed for 4 months before the leg broke off. I can't say I'm going as far as to 'tell you a tale' of its demise, but needless to say; it couldn't stand the heat. Difficult to assemble; wooden side rails look cheaper in person than I hoped for. "Can this frame be used with an adjustable bed?" This frame can’t be used with an adjustable bed. "do you sell matching nightstand and drawer?" The night stand can be found under ITEM# 20217070 while the chest can be found under ITEM# 20217071. The chest is currently out of stock and the approximate ETA is 4-25-2017. "How many boxes does this product ship in? Can you also provide box dimensions? Thanks, Alex"
This queen bed is shipped in 3 boxes and the dimensions are: Box 1- 84” x 19” x 5.75”H, Box 2- 66” x 24.5” x 4.5”H, Box 3- 68.75” x 21.5” x 4.5”H. The bed does not require a box springs. It has slats that will support the mattress.